>How can I join the club? For new members, click on the "Join or Renew" tab at the top of the website and follow the instructions. >Can I run with the club without joining first? Yes. You do not have to be a member to join in on the open runs. 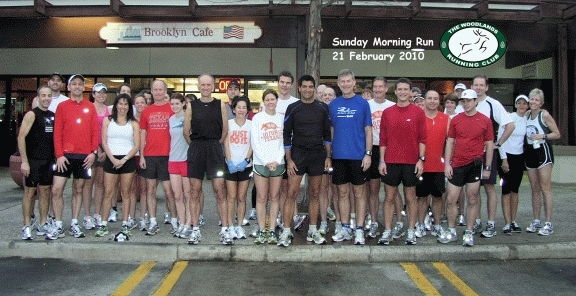 The largest runs are the group runs on Saturday and Sunday mornings. Check out the “Open Runs” tab for more details. >I am visiting from out of town; can I run with the club? Yes. You do not have to be a member to join in on the open runs. The largest runs are the group runs on Saturday and Sunday mornings. We have had people from Houston, other parts of Texas, other states and even other countries join us for a run. Check out the “Open Runs” tab for more details. >Does the club offer formal training or coaching? No formal training except for the “TWRC Juniors Running Program”. TWRC is a club, not a training program like “Woodlands Fit” or a paid coaching program. Several of our members also train with a coach or other formal training program. >Do you have to be fast to join? No. Our members run the gamut on fitness and speed levels. Yes, the club has some sub 3 hour marathoners but most are not that fast. There are some that run 5-6+ hours marathons and some that have never run a marathon and have no desire to. >How large is the club? About 200-300+ members with 50-100 that actively run with the either the Saturday or Sunday morning groups. >Do you have to live in the Woodlands to be a member? >Does the club travel to races? Not formally. Over the years, small groups of members have traveled to marathons, half marathons and trail runs together. Since 2008, there has been several larger but still loosely organized fall group marathon trips (New York 2008 and 2009, Chicago 2010, Berlin 2011, San Francisco 2011, Marine Corps 2012, London 2013, Las Vegas 2013, Philly 2014, Victoria, Canada 2015, Berlin (again) 2016, Big Sur 2017, Banff 2018). >What distances do the club members run? Saturday and Sunday group runs are usually between 6-12 miles but some do more and some do less. In terms of races, some members do not race while others run 100 milers or are working on running a marathon in every state. >Can I join if I have never run before or new to running? >Should I carry water for the long runs? It is up to you, some carry water and some do not. In the summer, it is very hot and humid. While we try to run routes that pass water-fountains, you may need water more often. In warm weather, be safe and bring water with you at least until you have run the routes a few times. >How long is a club membership good for? Club dues are for a single fiscal year (July 1 to June 30) without prorating. That said, if you join after April 1st, your dues would include the current and next fiscal year. For example, if you join May 3rd 2015, you will be considered a member for 2014-2015 and 2015-2016. >What is the club's address? >What are the benefits to joining? >How do I learn more about the club? The best way is to check out the website and then join us for a Saturday or Sunday run. If you have specific questions, please use the website contact form. >How much does the club cost to join? The cost is $21 for an Individual or $26 for a Family membership. Additional membership details can be found under Join or Renew. >I joined The Woodlands Running Club (TWRC) Facebook group, am I a member of the club? >How do I know when information is posted or changed on the website? Yes. Login in first and then click on the "Join or Renew" tab at the top of the website. >Can my spouse have a TWRC website account as well? Yes. For family memberships, The Woodlands Running Club allows one “spouse” website account in addition to the primary account. If you sign up for a family membership, you will receive a TWRC “spouse” coupon code in a follow-up email (Much like the HARRA membership process). You can (but do not have to) use this one-time code to register your spouse or other family member. This code is unique to your membership order and is non-transferable outside your family. If you decide to use this code, your spouse MUST "order" the free membership using their email address in order to have it applied to their account. >Does the TWRC website offer any other news? Yes, the site currently has four RSS news feeds on the front page. Just scroll down and you will find the “Houston Chronicle's Running Notebook”, “New York Times - Health”, “New York Times Fitness & Nutrition”, “Runner's World Headlines” and the “Cool Running News” sections with links to top stories. >Where are the photos, newsletters and other club information? Login in and under the Members Only section, you will find: The TWRC Photo Gallery, The Message Board, Current Deer Tracks newsletters and archives, Board Meeting Minutes and archives, Club By-Laws, Links to More pictures and Blogs on the TWRC website. >I logged in but there is nothing under the Members Only tab. Why? You membership probably lapsed, you can renew online. If you believe you are a current member, please use the contact tab and contact the registrar. 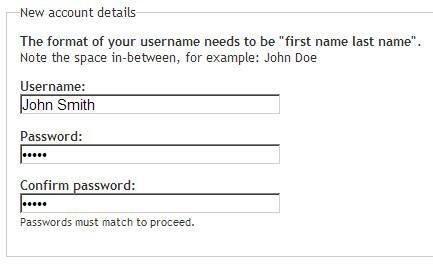 Your first and last name with a space in-between, for example, “john doe”. The username is not case sensitive. We are using the first and last name you have on file with TWRC. If logging in with your first and last name does not work, try using your full email address. For username changes, please use the Contact tab and the category “Website –TWRC”. >My TWRC username does not seem to work or has been changed. 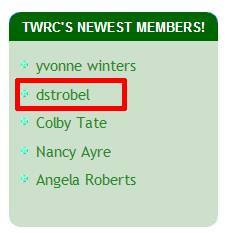 The TWRC website uses first name SPACE last name as the username. The username is NOT case sensitive but the password is. When members join TWRC for the first time they sometime miss the instructions and just make up a username. The website admin or registrar then has to go in and manually change the username to the first and last names used in their TWRC profile. If you did not use your real username when you registered, it may have been changed. 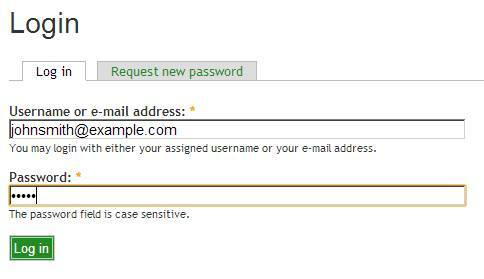 Please use your first and last name to login OR your email address as your username. >I forgot my password, how do I reset it? To reset your password, go to the login page, pick the “Request new password” tab. Fill in your email address that the club has for you and the site will send you an email with a one-time link that expires in 24 hours. Click on the link to log into the site. Scroll down, on the right-hand side, you should see the Nav menu. Click “My Account”, then click the “Edit” tab. Type in your “new” password twice. Once you type in your new password, the website will ensure they match and give you feedback on the strength of the password. Again, at this time, as long as they match, the password is good. The LAST step is to click SAVE at the end of this webpage. After you click “Save”, you should get a message that says “The changes have been saved.” You are done, your TWRC password has been changed. Questions? Please ask. This site is still growing. Do you see any typos? Have any suggestions? Want to contribute and update some of the pages? Have some content ideas? Please let us know via the contact form. Copyright © 2019 The Woodlands Running Club. All rights reserved.